Rob Williams’ latest Dredd tale is slowly evolving into an interesting beast, living up to the promise that “There is a very big moment in Dredd’s world coming.” [Rob Williams prog 2100]. For some the thought of conspiracies within Justice Dept smell of cliché and such ideas have been done to death in popular media in recent years. The team that Dredd has pulled around him; an architect, an insane Wally Squad Judge, an Accountant and a street judge certainly fail to fit most models of a crack team. Up against the mysterious Smiley and his team of Enceladus Energy Empowered Ninja Judges and without the sanction of Hershey the team certainly seem in a challenging place. Perhaps what is more of interest is whether this tale will prove Hart’s argument that “re-examining the roles of flagging props can reinvigorate them. [which] happens whenever an author looks deep into a literary device, discovers why it still holds meaning for them, and refreshes interest in that literary device by evoking its essence in an entirely new way.” Is Justice Dept and Mega City One, is Dredd himself, that literary device that is being reinvigorated? History features large in this tale. The history between Dredd and Hershey. Dredd’s pivotal role in the history of Mega City One. Smiley’s hidden role in the same history, his invisible hand that we were first introduced to in Trifecta. Chief Judges of history; Cal and McGruder. Frank’s pre-Wally squad history with Smiley. Dredd’s old foe Kazan’s aging, decaying clone. Political challengers to the judicial system in Blondel Dupre. Against all this ultimately looming large, locked away behind cryptography, the file for 2103; the year after Dredd and Hershey returned from the Krysler Expedition. A year of seemingly inconsequential cases and a looming threat that ultimately evolved into all-out war with East Meg One. It seems that the weight of those years is evolving a physical reality for Dredd, pressing down hard on him. The question of his role in the actions that has outraged him, that sent him once before into the Cursed Earth in response to how he saw Justice Dept developing. Dredd has been here before, questioning his place, the role of Justice Dept, of the reign of the Judges. Kraken puzzled over his annotated note on “the Big Lie”. Dredd shared his misgivings with his mentor. He commented previously on the tactics the Judges use to maintain their rule. Yet this was before the encounter with the Father of Justice, Fargo, once more. How much do Fargo’s words haunt him? How much does his lie to Hershey bother him? For Fargo to judge what had grown out of his works so harshly could hardly have washed off him so cleanly. 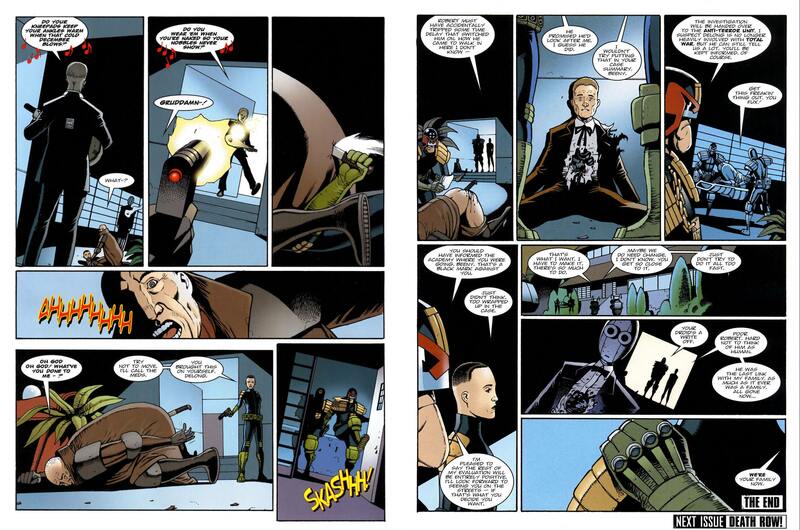 Now though Dredd does not have a mentor with whom to share his thoughts. Moreover the circle of trust has drawn ever smaller and even that has been infiltrated. Kazan may well have served as a foil but at the same time he also lay out small nuggets of wisdom for Dredd to mull over in his barbs. Now even that has been taken away. So what is the ‘Small House’ of the title? Is it Dredd’s world, Mega City One? The once sprawling metropolis that dominated the whole Eastern Seaboard now reduced by war, terror and plague? Is it Justice Dept? The previously indomitable judicial force now reeling from the events of the past forty years? Is it Smiley’s humble abode? The hidden dining room that he inhabits, hidden behind the walls of the Grand Hall? Or is it all of the above? Returning again to Hart, it is worth considering his observation that “what kind of living space the house is, and what it says about the inhabitants” is pertinent here. Once more history figures here. Smiley’s house is redolent with historical iconography. The flight of ducks on the wall would likely be a familiar figure to more aged readers. The dining room arrangement of Smiley’s house, so mundane and familiar. The old fireplace, the gas lamps and sideboard. All of a similar historical era. Just like Smiley himself, both a name and character from literary history. The quintessential spymaster always slightly removed from officialdom in his duties and actions and yet intricately linked. Everything about him points to the past. In respect of Dredd, the question of house or home becomes a compelling one. Everything seems to be pointing to a perturbation. Everything Dredd has come to know and believe is being increasingly challenged. His own ‘father’ has questioned the home Dredd has come to know and love. It is the source of his identity, of his very being. His commitment to justice has always been unwavering but his commitment to Justice Dept has been measured against this standard. It is hard to imagine the conflict that such tension must provoke. Doubtless it is only his training, upbringing and experience that has enabled him to weather it. What then when the instability that has been introduced slowly grows into something greater? 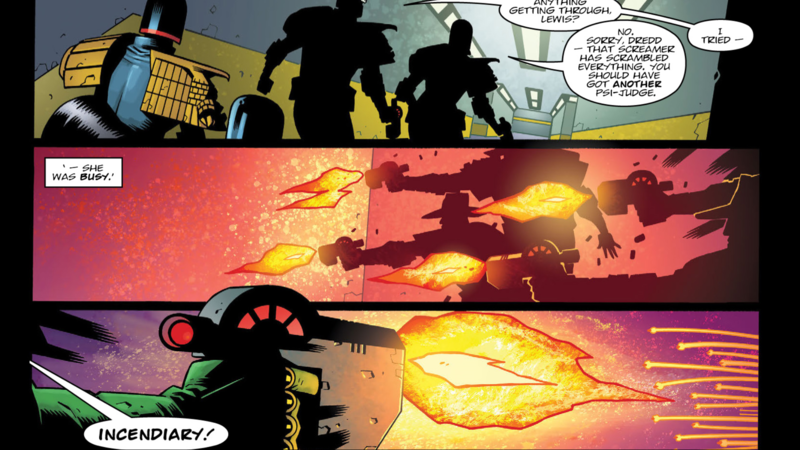 Is this what is at the heart of Williams’ latest exploration of Dredd and his world? 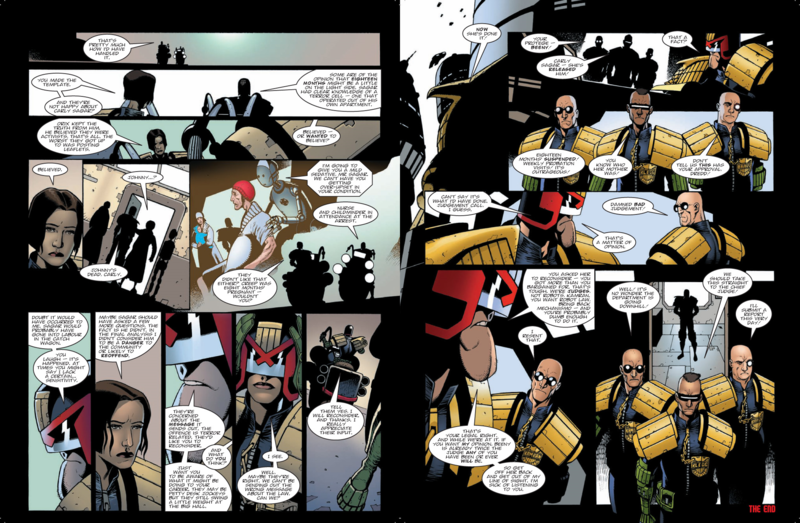 In disturbing the very centre of Dredd’s being, upending his world and his relationship with the other inhabitants an opportunity exists to redefine Justice Dept, its relationship with its citizens and the way in which the city is run. Is this at the back of the reference to Blondel Dupre and the fact that the Judges are Fascists? Are the seeds Fargo planted in Dredd’s mind about to bear fruit? It would certainly be interesting to see how a world in which Dredd and his fellow Judges find themselves in a completely different relationship with the citizens they rule over would develop. I'm not a huge fan of the larger Titan storyline (although I love the Low Life elements), but I have no problem with Beeny's absence. 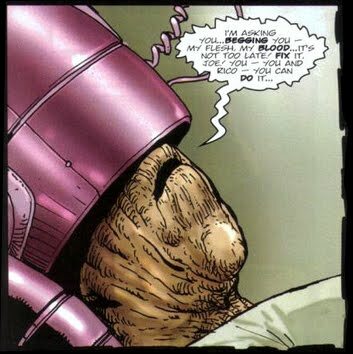 Frank is quite correct in terms and of the real-world reasons, but in-universe her association with Dredd has negatively impacted her career as a judge already: her exile in Tour of Duty, and her experiences before, during and after Chaos Day (although the latter not entirely his fault). It's important to Joe that she doesn't get sucked into his dodgy dealings, because she's his one shot at redemption, at creating a better Justice Dept than he can manage, and maybe even fulfilling Fargo's request. It's still a big Justice Department. Dredd doesn't need to hang out with the same judges every day. We've seen much less of Giant over the last ten years than we used to, so I'm glad he's back. (Beeny's) association with Dredd has negatively impacted her career as a judge already: her exile in Tour of Duty, and her experiences before, during and after Chaos Day (although the latter not entirely his fault). It's important to Joe that she doesn't get sucked into his dodgy dealings, because she's his one shot at redemption, at creating a better Justice Dept than he can manage, and maybe even fulfilling Fargo's request. * So she survives until a time she can complete the task he's unable/unwilling to perform himself. It's interesting to consider whether that's the reason Dredd avoids the role of Chief Judge - because then he'd have no excuse not to do what he knows he should (references: Megazine 300 & 252, respectively). Never thought of Dredd as Hamlet, before. One thing that occurs to me, is can we have a major, scenario changing event happen in a non-Wagner Dredd? And I think the answer to that needs to be yes (so long as Wagner agrees to it) for the good of the strip i.e. so we know it can happen in any given story. Wagner has not been writing Dredd for a while now and maybe it is time that someone takes over the reigns and direction of Dredd. Yes, Wagner is the Dredd writer and I wish that he will write more (I know he will doing a Dredd coming Feb 2019). As Rob said in prog 2100 their is major changes coming to Dredd, it is already started with 2105 let us see where he takes us. Not sure when the last Wagner Dredd was, but it has been discussed quite often on this forum. IIRC he has been averaging about 10 to 15 episodes per year recently. I am sure someone like Frank would be able to tell us. But the thing is, he is still involved and is surely viewed by most squaxx as the “owner” (even if technically that is Rebellion) so any major changes would (morally) require his sign off (to be credible). Wagner wrote a few Dredds for specials and the Dark Judges story, Dominion, during this period, as well as giving us more Strontium Dog with the late, great Carlos Ezquerra. And Rok Of The Reds arrived, with more to look forward to. Not bad for a pensioner. * including Dark Justice, which was written in 2012 and originally meant to appear in 2013. "Wagner" must at least give his thumbs. Is 2018 the first year when Wagner write no Dredd for the prog? October 1991 - May 1994 was a holiday for Wagner. He was writing Dredds for the Megazine during that time, though.